A medium sized vessel of standard rating. Built in 1982 and refit in 2002. The Island Escape carries a maximum of 1690 passengers in 761 cabins, 5 of which have balconies and 472 have ocean views. 4 cabins are available for disabled passengers. Cabins are small but have telephone, TV and sufficient storage space although the bathrooms are small. The Island Suite has seperate living area with jacuzzi. Entertainment features 2/3 entertainment lounges and casino. Sporting facilities include fitness centre, sauna and gym. Overall the ship was OK. The food/staff/cabin are above average for this type of cruise. But, there was always a banging/crashing in the night /early morning. It made it hard to sleep. The ship cruised as though it had a problem with its stabilizers, going that slow it should have been almost still, allowing for some slight roll. We had our suitcase handle smashed upon leaving ship by the baggage handlers. We joined the Island Escape at Palma and all seemed okay on arrival. We were shown to the cabin deck 4, cabin no 4044. That's when we realised we made a mistake and paid extra for an out Side cabin two port holes. As we left Palma the noise from the engines was terrible could not sleep at all, even with ear plugs in. We complained the next morning, they said the ship was full and could be moved, so we requested to leave the ship at the first opportunity this was also not able to be done. We had to spend two weeks of hell listening to the racket from the engines. Never again and this has put us off a cruise holiday for life. It is a pity as the crew and staff entertainment were great and could not do enough for you. The cabin steward Warley did all he could to make the cruise as pleasant as possible. Entertainment was very good and food reasonable. Had a fab time. The ship was spotless and the staff were constantly cleaning. The rooms are cleaned twice a day. All the staff, crew and entertainment team are all exceptional. The food and drinks were lovely. I could NOT FAULT a thing, A star plus all round. We will be booking up for next year ASAP. This is my 2nd holiday on Island Escape and can't recommend it highly enough. It might not be the nicest looking ship around, but it's the friendliest ,the best food and the best entertainment I've seen. I wanted a holiday for my son and I, this was perfect. The standard of food, service and hygiene was exceptional. I have never been on a cruise before so had no idea what to expect, I was pleasantly surprised. Yes the ship is a little dated but it really didn't matter. Fellow passengers were friendly. Only criticism was too much space allocated to smokers but not that big an issue. The staff worked so hard and are a credit to the company . Yes, this is a no frills cruise ship but for the price I just don't know how they do it. For us it is more about the destinations, which we loved this time it is Rome, Nice, Barcelona etc. As we only slept and changed in the cabin it was perfectly adequate, food was excellent wherever you ate, all drinks were free and staff were marvelous. We are off again on the same ship but a different route to last time because it is just such fabulous value. I find it hard to understand what some people expect for £500 to include flights, food, drink and entertainment plus all the lovely sights we see. We have just returned from a Thomson Cruise on the Island Escape and just wanted to warn anyone that is thinking of spending their hard earned cash on a cruising holiday to avoid this ship like the plague! We have sailed on other Thomsons ships (Topaz, Celebration, and Spirit) and always had a good time but the Island Escape is in a class of its own and for all the wrong reasons! The all-inclusive package sounds pretty good until you get on board and then you are given a scrappy bit of photocopied paper which gives details of what the "all inclusive" includes-this takes up about 1/5 of the leaflet and the rest giving details of the cocktails, beers, liqueurs etc which you cannot have without paying extra. We knew that international brands were not included but what they don’t tell you is that apart from spirits there are no locally produced liqueurs offered such as Baileys, Amaretto, Tia Maria etc so if you want these or a cocktail containing these you have to pay extra at £2.50 a go! Noro Virus was rife on the ship which we were unaware of until again we were on board and started to hear the horror stories from people who were on the second week of their cruise and had all been ill and confined to their cabins at some point the previous week. The help yourself buffet was reduced to something like a bad school dinner experience where absolutely EVERYTHING was put on your plate for you by staff-even the bottles of HP sauce were kept behind barriers and a "dollup" put on you plate if you wanted any. The food choice was terribly poor and compared to the other Thomason cruise ships was a massive disappointment. Needless to say despite the efforts of the cleaning staff we ended up in our cabin for a couple of days with sickness and diahorria and when we finally docked in Palma at the end of our cruise the whole ship was getting prepared for a disinfecting "deep cleaning exercise" and any passengers who were unlucky enough to be staying on board for a further week, had to be transferred to a nearby hotel while this process was taking place. The entertainment was very hit and miss,-evening shows when they were on were excellent- but the daytime entertainment was virtually non-existent and consisted mainly of badly photocopied picture quizzes and bingo. On the days when the weather was awful or when we were at sea, there was no "contingency" entertainment added when it was raining- only entertainment cancelled if it was scheduled to be held at the poolside. The ship itself could only be described as a "rust bucket" which was obviously not up to sailing the bad weather conditions we experienced. Even though the captain kept reassuring us that the stabilizers on board would help in the stormy conditions this was not the case. We were on deck 9 at the rear of the ship and felt every movement and the loud clanging noise that accompanied every sway was horrific and made trying to sleep a nightmare! The only plus to this whole dreadful experience was as usual the wonderful and hardworking cabin crew and bar/waiting staff. In my opinion the word "informal" which is used to describe this cruise should be changed to sub standard. We paid £1600.00 for something which at best could only be described as cheap and nasty. Just returned from a last minute holiday on the Island Escape with my sister (both in our 40s) and had a great time! There are pros and cons however. Having previously been on P&O cruises this boat comes nowhere near. The facilities on offer do not compare and it is nowhere near as luxurious. Cabins are small and dated but cleverly designed with plenty of storage space. There is one small pool and a distant lack of places to sunbathe. However these are my only bad comments! Now for all the good bits! The boat is aimed at being relaxed and informal and we really liked this. No dressing up for dinner and no set meal times. Two of the three restaurants were self-service. The food was amazing! Brilliant choices every day and always something different. Food available around the clock apart from 2-4.30am! Couldn't complain about it at all. All the staff were hard-working, friendly and always happy. Our cabin steward kept our cabin spotless and we quite often came back to a towel animal in our room which always made us smile! There was plenty of entertainment, epecially in the evening. There were two main areas - one of which had a show (by the brilliant entertainment team), singer or comedian and the other a quiz show or something with audience participation. As well as these there was the pub with a singer, the resident band played in the open air on the top deck and there was also the casino and disco. The boat stopped at great locations and we did four of the excursions, all of which were very interesting, although slightly on the expensive side. All in all we had a great time. If you want an all-inclusive, relaxed, laid-back friendly cruise with good ports, plenty of night-life and a mixed age group then this is the one for you. If you want a more upmarket formal cruise with waiter service and a dress code for dinner then give it a miss! We have just returned from a two week cruise on the Island Escape. This is our 7th time on the ship and each one gets better. The crew and exceptional and can't do enough to help. The show team this year are the best I have seen and Ross did what only Ross can, entertain. Our cabin steward and assistants worked tirelessly to keep everything clean and tidy. Lots of negative reviews but you can only speak as you find and we found everything to be fine. 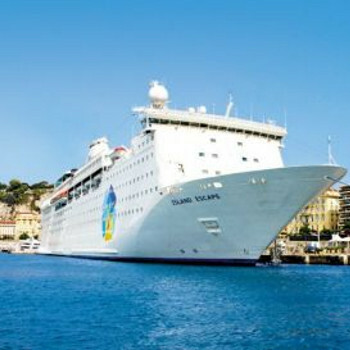 Cruising in late June/July/August would resolve the bad reports on this ship.